In June’s SI I touched on the stickier than usual response we’d been getting on the doorsteps in Aberdeenshire, both for the local and the Westminster elections. It’s something which had been apparent for a while, but even then, it was hard to imagine that MPs of the stature of Alex Salmond and Eilidh Whiteford might be in any serious danger of losing their seats. Just how wrong can you be? On the surface it looks like a remarkable turnaround for the politics of an area which has long had competing Tory and deeply anti-Tory tendencies. However, before our mood turns as blue as the swathe now painted across the Westminster electoral map of NE Scotland, it’s worth looking at what has really been happening in recent electoral contests in the region. If we take 2010’s Westminster election as a baseline, the story which emerges is one of extreme volatility and the almost complete collapse of a political party. Contrary to popular belief, that collapsing party isn’t the SNP which in Moray, Angus, and Banff and Buchan reverted more or less to 2010 levels of support, and in Gordon and in West Aberdeenshire and Kincardine remains substantially ahead of 2010 support levels. Rather, the story of the past 7 years has been the complete and utter collapse at parliamentary level of the Lib Dems, and how some of their former supporters have voted since. The early announcement of plans to legislate for Indyref 2, allied to a vigorous Tory campaign against it, certainly hardened opinion against the SNP in the North East, as indeed it did in other parts of Scotland. 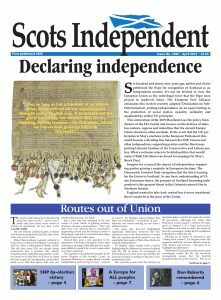 It remains to be seen whether the ‘reset’ of any post-Brexit Indyref timetable reassures on that front. However, there were signs of a slip in SNP fortunes in the North East in the 2016 Holyrood results, so there’s obviously more to this than just Indyref 2. Indeed, there are a number of factors specific to the North East which have helped to drive voters in that direction. Firstly and most clearly, there is the prolonged downturn in oil and gas. The sector is recovering after some painful restructuring and employment has remained high, but this remains an area where people are feeling considerably less prosperous and secure in their jobs than they ever have before. Then there’s Brexit. Although the North East as a whole voted to remain, some areas voted very heavily to leave, including areas where the SNP had traditionally been very strong. Our hostility to Brexit may have been consistent and principled, but it put us at odds with a number of our voters who had never previously until that point questioned their SNP allegiances. If the fishing community was pretty uniformly for Brexit, the farming community was less clear cut. However, what was unambiguous was the anger over the late payment of farm subsidies and the perceived failure of the Scottish Government to either make the system work, or put in place a suitable work around. Much of the political capital won in rural Scotland by the SNP has been lost because of this single issue, and it’s going to take a lot of hard work and time to earn that back. Then there’s police and fire reform, including the centralisation of control rooms. Again, not new, but when married to a £120m pupil attainment fund to be paid for through increasing the council tax on band E-H houses (something which would have seen £8m raised in Aberdeenshire and only around £2m returned), suddenly every jibe made in the local press and by local politicians about centralisation and the party favouring the Central Belt – whether fair or not – began to stick. Although the Scottish Government listened and acted quickly to fund the scheme centrally, the next round of outrage followed swiftly with the business rates revaluation, which had valued business properties using a 2015 baseline – just before the oil and gas slump kicked in. While the Scottish Government responded with a local rates cap package and Aberdeenshire Council introduced its own £3m rates relief scheme, the local political credit went instead to Conservative politicians who – irony of ironies – had voted against the budgets at Holyrood and council level needed to make it all happen. Any party in government for 10 years in a country as diverse as Scotland will find it harder as time goes on to build on and maintain its coalition of support. In the North East, we have allowed others – particularly the Tories and an editorially hostile local daily newspaper with a large circulation – to tell a story of the SNP being more preoccupied with Independence and with other parts of the country than in the needs of the North East. I have disputed and will continue to dispute this contention for so long as I have breath in my body to do so. Nevertheless, it’s a view which at present has a ready and appreciative audience. We have paid a significant price for this, both in terms of a falling back of our own vote, as well as in the re-emergence of the Conservatives as a party which people feel has lost its previous stigma and is now seen as the natural home for those voters who are presently ill-disposed towards the SNP. If the SNP looks for the moment to be down in the North East, it is certainly not out. Some rest and reflection is in order for us all and there’s doubtless a range of other factors which I’ve missed out due to constraints of space, but there’s no secret to the road back. Listening to our communities, having a willingness to speak up fearlessly for what’s important to them and presenting an open, optimistic vision for Scotland is what brought us success in the North East before. It will do so again. Next Post: Wealth before Health? Excellent comment. Right on the ball. In my opinion many of the problems of the North East would have been if not overcome at least seriously lessened IF the UK government and accepted the SNP’s argument for an oil fund similar to that in Norway. With a fund like that it would have been possible to reduce many of the difficulties facing not only the oil industry but fishing and agriculture, or am I the naive one?